Borrowdale, often referred to as Cumberland Borrowdale to distinguish it from Borrowdale in the county of Westmorland, lies in the central Lake District. The River Derwent flows through the dale into the lake of Derwent Water. 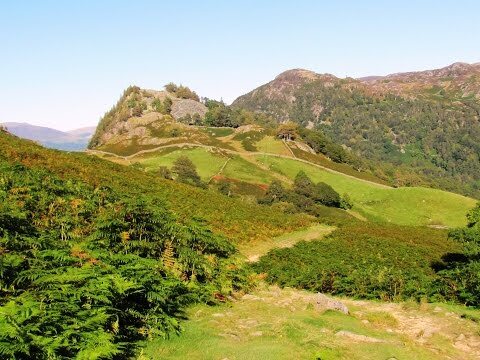 Borrowdale is also completely within the Lake District National Park and houses the villages of Grange, Rosthwaite, Seathwaite, Seatoller, Stonethwaite and Watendlath. Above Grange Bridge, Borrowdale is constricted between the steep slopes of King’s How on Grange Fell and Castle Crag below High Spy. This narrow gorge, known as the Jaws of Borrowdale, was carved by the last Ice Age and erosion over thousands of years. Borrowdale is one of the most beautiful places in Cumbria with sheep grazed uplands and extensive areas of oak woodland draping the hillsides. The valley is a very popular tourist location, with hotels, guesthouses, holiday cottages, bed and breakfasts, youth hostels and campsites catering for the lowland visitor as well as the hill walker. The National Trust cares for and undertakes a great amount of conservation and access work in this very special and beautiful area. Grange often called Grange in Borrowdale lies about 4 miles south of Keswick in the narrow gorge known as the Jaws of Borrowdale. The small attractive village sits on the other side of the double arched bridge built over the River Derwent in 1675. Grange close to the southern end of Derwent Water houses the Holy Trinity Church built in 1861, two cafe’s Grange Bridge Cottage Tea Shop and Grange Cafe. Just slightly out of the village is the Borrowdale Gates Hotel. The novelist Hugh Walpole lived at Brackenburn, a large house 1 mile to the north of Grange, from 1924 until he died in 1941. Seatoller a very small hamlet which lies on the B5289 road at the east foot of Honister Pass consists of two rows of cottages, a farm house, two bed and breakfasts and a tea shop. The village was the destination of a regular walker’s bus in the 1960s and 70s which left Carlisle every Sunday at 7.30am giving them access into the heart of the lakes by public transport. The River Derwent rising at Styhead underneath Scafell Pike flows northwards through the Borrowdale Valley into Derwent Water. The river then continues into Bassenthwaite Lake picking up the River Greta just outside Keswick. From Bassenthwaite the river flows westwards, providing crystal clear water for the newly formed Lakes Distillery in the Isel Valley before leaving the Lake District National Park just before reaching Cockermouth. The River Cocker joins the River Derwent as it passes through Cockermouth then it continues its westward journey by Papcastle, where a Roman fort bears its name, before entering the Irish Sea at Workington. The Cumbria Way is a 70 mile long distance footpath passing through the heart of the Lake District National Park linking the two historic towns of Ulverston and Carlisle. The route cuts through the most beautiful Lakeland countryside via Coniston, Langdale, Borrowdale, Derwent Water, Skiddaw Forest and Caldbeck. The Cumbria Way was originally developed in the 1970’s by local Ramblers’ Association members and is mainly low level but does contain some high level exposed sections and the highest point is High Pike at 658 metres (2,159 ft). The way marking of the entire route was completed by volunteers and national park staff in May 2007. From the car park on the B5289 we cross over the road and follow the path at the side of the river. At the bridge we turn right and follow the road through the village. Immediately after Grange Cafe we turn left at the signpost, Seatoller 3 mile. We head forward on the tarmac track through the trees until we come to a public bridleway sign we turn left for Castle Crag 1¾. We now follow the stone track past the camp site until we come to the river. We head forwards and turn left at the sign for Rosthwaite on the Cumbria Way. We go through a gate and head forwards through the trees with the river on our left. We walk up some steps and turn left through the wall. At a tiny rise the path splits we turn left following the signpost for Rosthwaite. We drop down through an old quarry and keep heading forwards. At the end of the trees we go through a gate into open fields and follow the track towards the river. We come to an old stone bridge, which would take you Rosthwaite, but we head forwards over a wooden bridge keeping the river on our left. We head forward and turn left in front of a gate then follow the narrow path between the river and a fence. We pass the stepping stones and keep following the path. As we come to Longthwaite we go through a gate and head forward on the track with the building on our right. At the bridge on our left we turn right and follow the track in front of the Youth Hostel. We keep heading forwards with the river on our left. We pass through a gate and follow a stone path which bears slightly right into the trees. We go through a wall and turn left over the stile into the car park at Seatoller. At the end of the car park we turn right and follow the road uphill for a short way then turn right at the footpath sign steeply uphill on the steps. At the top we bear slightly left passing a lone tree towards the gate in the wall in front. We go through the gate and turn right following the wall on our right. We keep following the wall on our right and soon we can see Castle Crag in front and Rosthwaite down below on our right. We cross over a few streams and a little foot bridge and keep heading forwards on the path to pass below Castle Crag. We follow the stony track until we come to the river again then retrace our steps back to Grange. This is an easy to moderate walk on minor tarmac road, good gravel and stone paths/tracks. There is a steep ascent from Seatoller. Elevation: approx lowest point 75.7m (248.3ft) approx highest point 242.6m (796ft) approx ascent 334.80m (1098.43ft). Approx 6.4 miles allow 2¾ – 3½ hours using OS Explorer Map OL4, The English Lakes North-Western area. This walk is clockwise. Start point: Car park on the B5289 just before Grange. Grange is in the Borrowdale valley in the Lake District, Cumbria. From the A66 coming from the east take the A5271 for Keswick. At the junction turn right. At the traffic lights carry on forward. At the mini roundabout turn left then left again at the junction. At the roundabout go straight over then at the next roundabout turn right and follow this road the B5289. From the end of Derwent Water Grange is less than a mile on the right over a double arched bridge. The car park is on the left just before Grange. Parking: the free car park at the side of the road on the B5289 just before Grange and limited free parking on the road side around the village. There is a National Trust Pay and Display car park at Seatoller and at Rosthwaite. There are public toilets on-route at Grange and Seatoller and there are also public toilets in Rosthwaite car park. For refreshments on-route there are two cafes in Grange and a tea shop in Seatoller. There is also the Borrow Gates Hotel open to non-residents and at Rosthwaite the Royal Oak pub and the Flock-in Tearoom at Yew Tree Farm. The nearest town is Keswick.